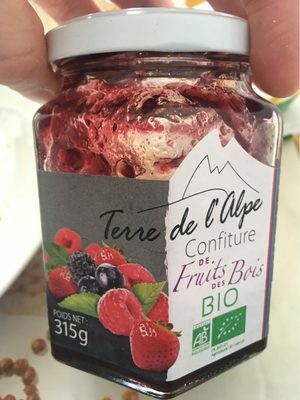 Fruits des bois* (myrtille*, mûre*, fraise*, framboise*), sucre*, pectine. *Produit issu de l'agriculture biologique. Product added on February 23, 2018 at 9:35:53 AM CET by kiliweb. Last edit of product page on May 24, 2018 at 11:47:41 AM CEST by moon-rabbit.